I was told I would be going towards pre-diabetes. I searched the web and found that Gynmema is good as I don't want to start on medication. I have started taking it. Could you please give some suggestions on this? I would be grateful. 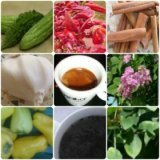 It is very good that you have found this marvelous herb to control your blood glucose level. Besides this, I have to congratulate you for choosing to control pre-diabetes with herbs and not with medications. Herbs are going to postpone the usage of medications and this will lead to better quality of your life of course. Anyways, regarding the usage of gymnema sylvestre, you have to know several things. The first one is that this herb can be found on the market at the form of capsules and at the form of drops. According to my personal opinion, it would be better for you to use the capsules, because you can take them everywhere with you, without being worried for accidental splits. The second thing is to remember that the daily dose of Gymnema Sylvestre capsules is 400-600mg. So, you have to pay attention to this, when you are buying the capsules. Regarding the drops, their concentration is equal no matter the producer. So, you have to use 4-6 drops BEFORE every meal. Although you haven’t mentioned your gender, I still want to remind you that there are no side effects found for this herb. So, when you are using it and you might experience something bothering, please contact your physician. In addition, it would be good not to use this herb if you are pregnant and lactating. At last, keep in mind that using herbs is not the only way of beating pre-diabetes and preventing diabetes onset. In other words, you can start following low-fat, low-carb diet and exercises along with the usage of this herb. Therefore, I advise you to start following the diet immediately and to pay attention to products like, fruits, vegetables, fish and other healthy stuff. Regarding the exercises, I thing it would be better for you to run for at least 30 minutes every day. With time, you have to start running more and more. 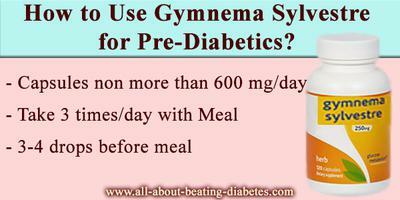 Those activities, along with the usage of Gymnema Sylvestre, will help you to maintain normal blood glucose level and to postpone the usage of drugs for pretty long time.